This item is expected to ship 4-6 weeks after the event on April 10, 2019. Are you looking for new ways to help your clients combat negative self-talk to push through fears and anxiety, and turn away from self-destructive isolating behaviors? In this recording, Pamela Malkoff Hayes, MFT, ART-BC, will help fill up your therapeutic toolbox with new and unique art interventions that will stop catastrophizing thoughts and negative self- talk. Experience how evidence-based treatments will help your clients learn to tolerate frustration, and sit with uncomfortable feelings, without the immediate need to self-medicate. Discover how combining art therapy with CBT, positive psychology and mindfulness helps to delay immediate gratification, look at the world differently, process fears, accept imperfection and let go of past anger and hurt. The powerful art interventions taught in this live webcast will help your clients transform their emotional response to past trauma, problem solve, change their perspective, and move toward a place of acceptance and gratitude. Implement more than 3 dozen specific art techniques that will enhance the treatment of people suffering from anxiety, depression, chronic pain and addictions. Acquire skills and understanding of how to effectively combine art and traditional talk therapy in both group and individual counseling sessions. Examine how the art techniques can help our clients learn to tolerate frustration, sit with uncomfortable feelings, and stop those catastrophizing thoughts. Experience, first hand, how art can provide a sense of calm, mindfulness, and gratitude for life. Combine art interventions with classic CBT skills and change the thought process to transform the lives of our clients. Connect the science behind the changes that occur in our brains when engaged in creative activities. 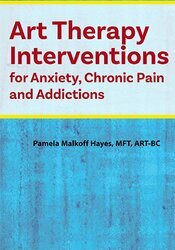 Pamela Malkoff Hayes, MFT, ART-BC is a Licensed Marriage and Family Therapist (MFT) in the state of California and a Registered and Board Certified Art Therapist with the American Art Therapy Association (AATA). Her specialties include: alcohol and drug addictions, relationship and parenting, depression and anxiety, grief, LGBTQ, gender identity and sexuality. She is also a court certified Sexual Abuse Evaluator and trained in Hypnotherapy, Eye Movement Desensitization Reprocessing (EMDR) and Emotional Freedom Techniques (EFT). Ms. Hays has a Bachelors Degree in fine arts from Parsons School of Design in New York, NY and Otis/Parsons in Los Angeles, CA and a Graduate Degree in marriage and family therapy and art therapy from The Notre Dame de Namur University in Belmont, CA. Over the course of her 25 + year career she has worked in schools, hospitals, prison, foster, and residential care, and private practice. Ms. Malkoff Hayes lives in Los Angeles where she has a private practice and provides art therapy groups to multiple drug treatment centers. She is a noted speaker and educator, lecturing throughout the United States. She has taught art therapy courses at Phillips Graduate University, Rhode Island School of Design (RISD), and Chicago School for Professional Psychology. She has written several books and produced several DVDs and online classes on art therapy. She stars in the video podcast, “3 Minute Art Therapy”, and was recently featured on “The Science of Happiness/SoulPancake” as the expert art therapist. Financial: Pamela Malkoff Hayes is in private practice. She receives a speaking honorarium from PESI, Inc. Non-financial: Pamela Malkoff Hayes has no relevant non-financial relationship to disclose.